The Seven Kings High School, in Ilford was the setting for this annual compliance event, now in its sixth year. Chris Ruane, Public Authority Development Officer of CILT welcomed delegates and introduced the first presentation, a ten minute video on ‘Improving road safety for vulnerable road users.’ The morning’s proceedings were then chaired by Austin Birks, Vice Chair CILT Logistics Safety Forum and one of the ‘stars’ of the film. Produced by the CILT and entitled ‘Our vehicles, Our Safety, Our Responsibility’, it served to ‘remind company leadership of the moral, economical and legal obligation to manage work related road risk, particularly with regard to vulnerable road users.’ It showed a fictional company, ABC Logistics, juggling the stresses of the business and prioritising what they thought were key strategies for them to succeed, with road safety not being one of these. The scene then changes from the boardroom to an HGV driver pulling up to a set of traffic lights, with a cyclist slipping in beside him. Both get distracted by their mobile telephones and when the lights change, the driver turns left, straight into the cyclist’s path. The keynote presentation ’Exactly what it says on the tin’, came from Nick Denton, TC for South East and Metropolitan area. His amusing, rather tongue in cheek style was well received by the audience. He began by saying that all too often, when new operators apply for licences and in particular, restricted licences, they sign the terms and conditions, without reading it. Usually there will be no Transport Manager in place and quite frankly, they don’t really know what they need to do in order to be compliant. To assist these people, a follow up to the application form is sent out and in more simplistic terms, highlights the ‘promises’ that they have agreed to make. I won’t run through all those here as I’m sure as established operators you know them thoroughly, but the section on retaining maintenance records for fifteen months met with much sniggering when he regaled stories of the common-place isolated office fires that had destroyed the reports and vehicle break-ins where these documents had been stolen! He went on to say that recurring failings are; operating more vehicles than what they are licensed for or from a different centre to the one registered and failing to tell a Traffic Commissioner within 28 days of any convictions or changes in maintenance provision or financial circumstances. This led smoothly on to the presentation from Dave Wood of the DVSA who updated the audience on the progress of the Earned Recognition Scheme which I covered in some detail in my report of the RHA Conference in September 2015 (B&CB 1347, 2 October 2015) reiterating the agency’s aim to move focus away from compliant to non-compliant operators. The remote enforcement office in Avonmouth has been used as a trial office for the last two years offering a more light-handed approach to enforcement. The staff there pick up on minor discrepancies and will alert operators of a potential non-compliance occurrence with a simple communication, whether by email or letter. This is due to be expanded to other locations later this year and is aimed to put compliant operators and those that need a gentle nudge into Earned Recognition status, without the need of a visit from an enforcement officer. In addition to this, The Strategic Traffic Management Office has been focussing on less compliant/non compliant operators by monitoring ANPR, road sensors and traffic monitoring systems. By mapping operators, they have been able to compile profiles of the worst offenders who will then be targeted by Roadside Enforcement Officers. Over 150 operators, both HGV and PSV, have taken part in blind trials for the Earned Recognition Scheme and as part of the process, they are looking at other schemes already in place from industry bodies as well as telematics data that will go towards their assessment. Although Dave frequently referred to the scheme as Earned Recognition, the name will change when it goes live in autumn and the details should be confirmed in the next few months. We will be looking at this more closely once everything has been finalised but it’s worth noting that to be accepted on this scheme, you have to have a history of compliance. Although predominantly looking at this from an FTA perspective, James had some pertinent points; he began by commenting that fleet recognition schemes (FRSs) had moved on from being ‘look at me, vanity’ schemes, although they recognise the importance of applauding the most compliant operators. He added that although FRSs are important, it should be considered that we already have one that works. Obtaining and maintaining an O licence is the ultimate assessment and the FTA feel this should be recognised as such without operators having to jump through additional hoops to gain award, referring to it as being ‘at the heart of any recognition scheme’. A number of systems were mentioned, including FORS (Fleet Operators Recognition Scheme) and he also pointed out that in order for operators to obtain certain contracts, such as in London for TfL, there were specific requirements. A slide showed in detail the various obligations for the different schemes already in force and the scale of the variables between some were huge. James expressed concern that with more Mayoral authorities pending and regional transport organisations becoming more common place, there was a real risk that different standards would be required in different parts of the country and throughout the UK. He summed up by saying schemes should recognise improved performance, incentivise behavioural change, reward achievement and punish poor performance. The final presentation of the day, relevant to our readers was from the road safety charity Brake. Professional Engagement Officer Dave Nichols’ presentation, ‘Steering drivers in the right direction’ certainly left the audience thinking. The statistics he presented us with were shocking; there are five deaths on Britain’s roads every day and 95% of all incidents are due to driver error. One in three crashes and one in four serious injuries are caused by drivers driving for work, they are one and a half times more likely to overtake when they can’t see, compared to others behind the wheel, with one in eleven admitting to using the internet and one in seven texting whilst in charge of a vehicle, these are statistically higher than those for other road users. What he made clear is that operators need to change driver behaviour and attitude, through education and awareness. This should form part of CPC training and it shouldn’t be a case of simply handing out the company handbook and never referring to the policies within. Drink and drug driving was discussed and led to the debate regarding mobile phones. Dave recommended that a no phone policy would be a practical solution, but as it isn’t a legal requirement, it was important that if this was introduced as a company policy, it should be well communicated, likewise with regards to drink driving the message should be repeated at key ‘hazardous’ times, such as summer and Christmas. An outdoor marquee housed a number of exhibitors but the main trade exhibition was sited a short walk away at the Ley Street Depot. The workshop housed a number of exhibits and the Tachograph Centre and this was also where lunch was served, partially sponsored by Stanford Coachworks. 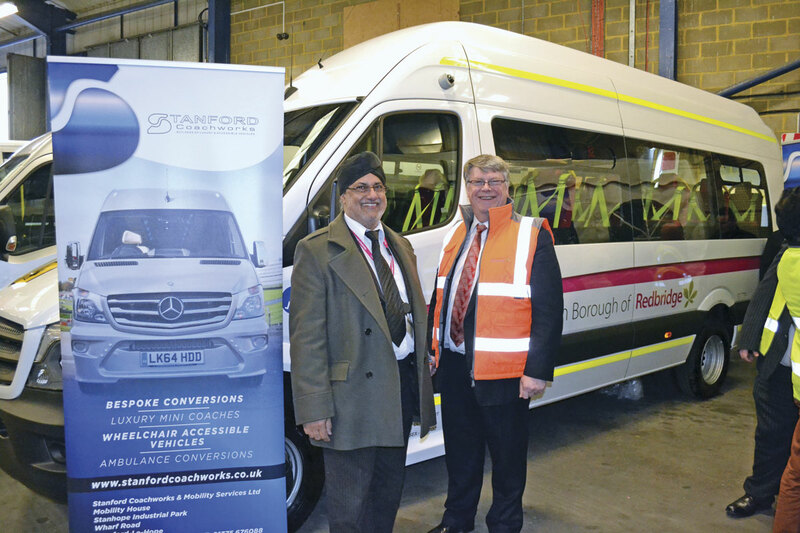 Essex based Stanford Coachworks have been working with and supplying wheelchair accessible vehicles to the London Borough of Redbridge (LBR) for the past 16 years. During this time they have supplied in excess of 80 vehicles, including Mercedes-Benz Sprinters and Varios plus smaller vehicles, all of which have been developed and designed following consultation with the Borough. They displayed one of five extra long wheelbase Mercedes Sprinters, recently supplied to LBR. It has their SCW Super Flat Floor, 15 saloon Phoenix Seats, Eberspacher climate control and PLS’ new Access Ai internally mounted cassette lift, fitted in the cavity between the flat floor and original OEM Floor. 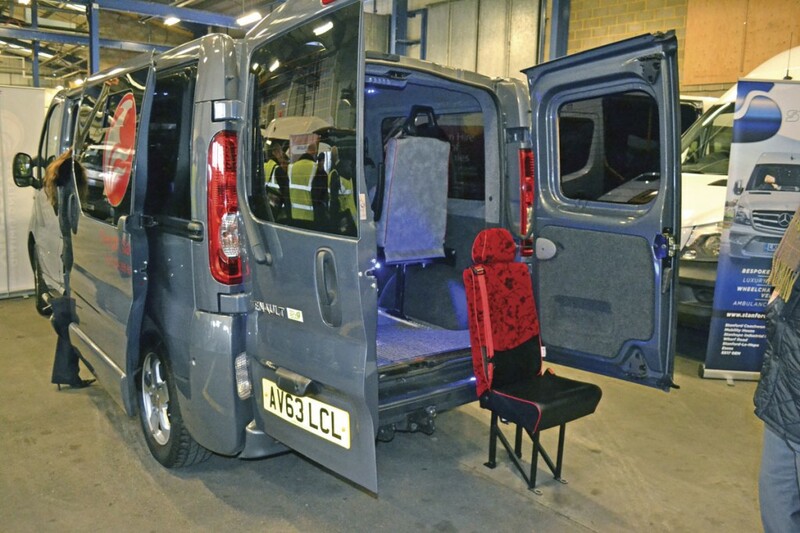 Phoenix Seating have supported the event since its conception and they displayed their demonstration vehicle which shows a range of their seats. Both Stacey Moore, Business Development Manager and Director Sara Tarrant were on hand to show the various options available. Yeovil based safety restraint engineers Koller Engineering, used the opportunity to showcase their new FAB leg, a fixed aluminium based system which has been specially engineered for bonded floor systems. It comes pre-assembled, making set up time quicker for the converter and is a simple, one handed operation. Andy Nurrish, Sales Manager at Koller, described it as ‘aesthetically far more appealing than other systems.’ The FAB has been M2 tested on a number of seats. 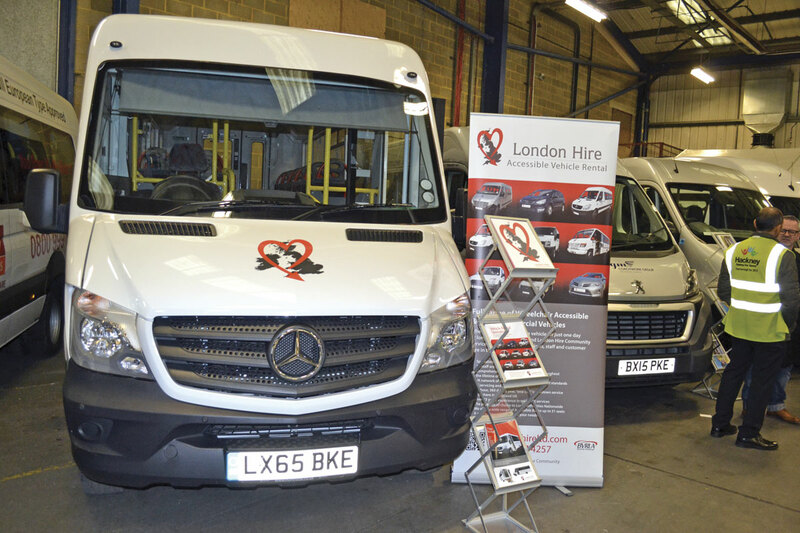 London Hire offer a daily rental and fully flexible contract hire service. Their maintenance package and like for like replacement vehicle back up, provides continuity of service to its clients. Peter Moxom and John Shire were on hand to answer any questions to those present. Two vehicles were on display from them, the first being a nine seat Renault Master from Stanford Coachworks, with a new ultra-light, ultra-low side entry step. 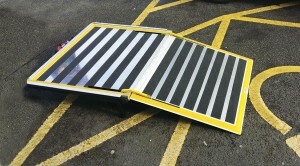 The step was developed in consultation with Stanford’s and London Hire clients that were struggling with the standard underslung step, many having been damaged by speed humps. This is standard on all future nine seat Renault Masters built by Stanford Coachworks and a retrofit option is available. The second vehicle was a Treka 16 seat Mercedes-Benz Sprinter with enhanced features unique to London Hire. These include Rescroft CT Space seating that was developed and produced in collaboration between Rescroft, NMI Safety Products and London Hire; a rear and side view camera system to reduce risk to other road users such as cyclists that is of particular interest to inner city customers; a cat lock fitted to the exhaust; a ‘fasten seatbelt’ sign and the externally audible ‘Caution Vehicle Turning Left’ (with night override) warning. GM Coachworks also supported the event with vehicles on show and representatives on hand to talk to visitors. This company operates from two premises in Essex, providing van linings and accessories as well as specialising in vehicle security. The City Dash is the latest addition to the Nu-Track range of mini, midi and wheelchair accessible vehicles. Bus and Coach Buyer’s Rob Orchard will be reporting on it fully in the coming weeks. The alloy construction, low, flat floor vehicle is built on an AL-KO chassis, with a Fiat Ducato/Peugeot Boxer cab and a choice of manual or automatic driveline. It can house up to 16 seated passengers or four wheelchairs and has single step or ramp side entry, wide gangway and wide door entry. Also from Northern Ireland was Cannon’s Euro Coach, which again will be covered in Bus and Coach Buyer in the near future. The model displayed was to a luxury specification with leather seating and USB sockets although a wheelchair accessible vehicle is available. This purpose built vehicle sits on Cannon’s own, purpose built Variant Softline chassis available with Cummins Euro5/6 engine options and a choice of ZF transmissions. The Euro Coach body is of box section steel construction, hot dipped at 500C and supported by a five year corrosion warranty. 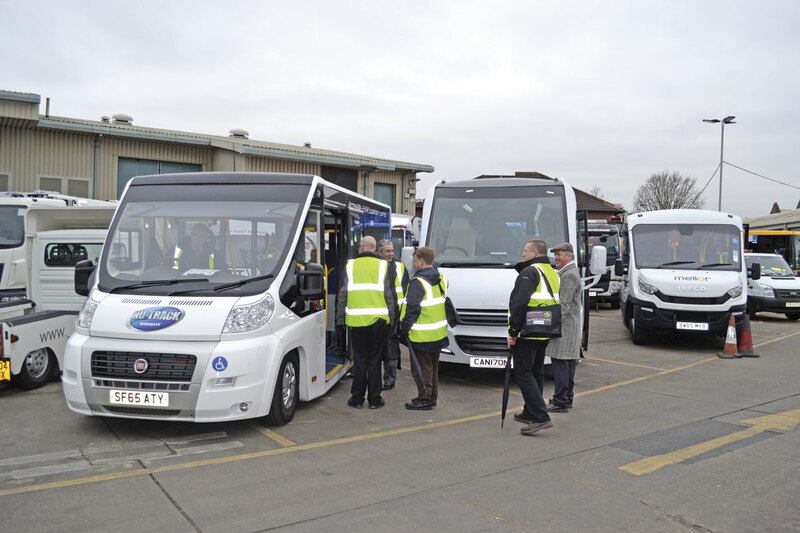 Unwin specialise in developing safe and accessible transport solutions for disabled people. Their new Peugeot Boxer demonstration vehicle was on display fitted with a number of their products. These include the Vista Split, an automated lift that when not in use is stowed in parallel to the vehicle’s sides leaving an unobstructed view and good access; a Century Lift wheel chair lift and an inboard ramp. Based in Sawston near Cambridge, Alfa Tail Lifts have been established for twenty years. 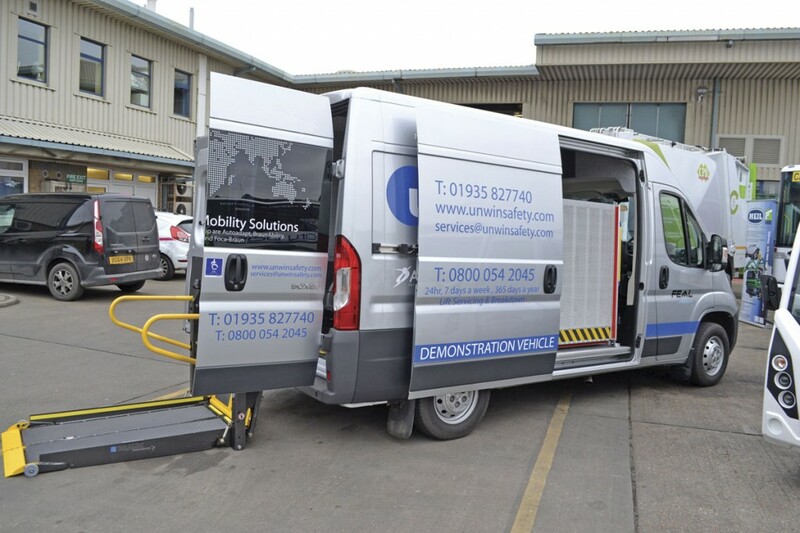 They specialise in the installation, repair and maintenance of tail lifts for both wheelchair and commercial applications whilst offering accessible conversions and other ancillary equipment such as steps and ramps. They operate a fleet of 24/7 service vehicles with trained service technicians and additional service premises located in London, Manchester, Falkirk and Bristol. 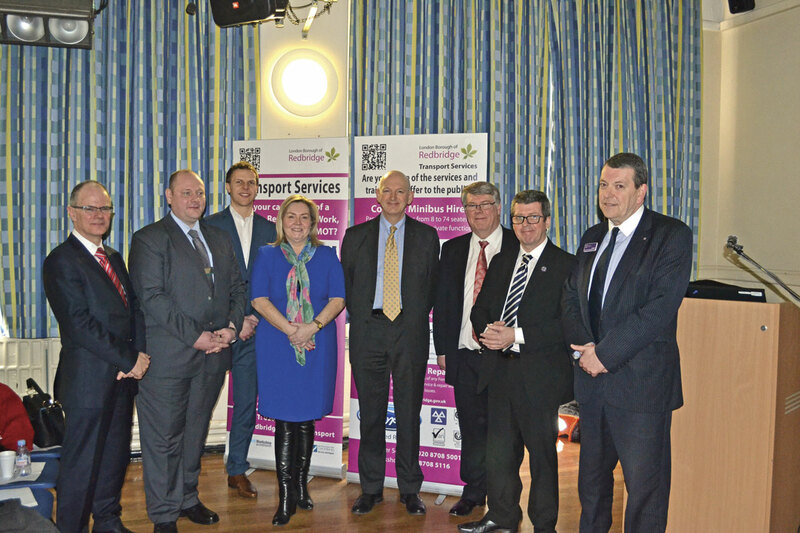 MD, Phil Gibbs said that despite the cold, the event had been worthwhile and was a good opportunity for meeting suppliers and customers. In addition to the Access Ai on the Stanford Coachworks vehicle, PLS debuted its AXS EPR electronically operated folding city bus ramp, designed to be deployed with the driver remaining seated. The company’s Access Lite underfloor lift was fitted to the London Hire Treka which also featured PLS Doorsafe and Stopsafe barriers. A VW T5 highlighted a range of WAV products available from PLS and Mobility Networks including the ultra-slim F6 side access platform.